His beak is orange. He sports a bright red ring around his pupils. His body is multi-colored, with striking areas of red, purple, black, brown and iridescent green-blue. 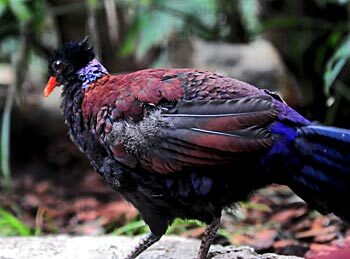 Native to the rain forests of New Guinea, he’s a beautiful, green-naped pheasant pigeon who hatched at the Milwaukee County Zoo, June 1, 2012. During his first four weeks of life, both parents fed him their own high protein, high fat regurgitated crop milk. The parents produced the milk from their crop, which is an enlarged part of their esophagus used to store food. Crop milk contains antioxidants and immune enhancing properties. Now that he’s fully fledged (able to fly), he can be seen daily, foraging on the exhibit floor, in the Zoo’s Herb and Nada Mahler Family Aviary. Since he’ll only stay at our Zoo a few months, make plans to see him soon!